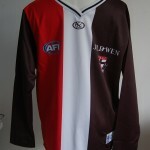 Footy news includes , ex Saint Xavier Clarke taking on a role as indigenous players advisor to the AFL , and Adem Yze , ex Demon , becoming an assistant coach at Hawthorn . 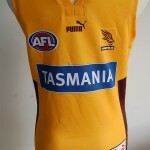 The Federal Government has given $15 million dollars to upgrade the Blundstone arena , in Hobart, where the Kangaroos , will play 3 matches in season 2012 . Ben Cousins , troubled former AFL player , is again having health problems, seemingly associated with his drug abuse . Mick Malthouse , ex- Magpies coach, states he was warned Cousins may relapse in season 2009 , prior to Cousins recruitment to the Richmond Tigers . Geelong forward James Podsiadly will probably miss the NAB Cup following shoulder surgery , in the off season , but hopes to be back at the start of the 2012 AFL Season . 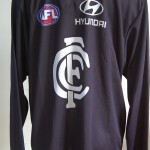 Similiarily Chris Judd, Carlton Captain , has has shoulder surgery and is now back in full training . 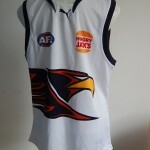 their football jumpers , jerseys , guernseys. 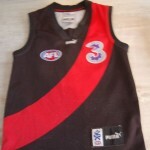 This entry was posted on Tuesday, January 17th, 2012 at 10:17 am	and is filed under AFL, football jumpers, NRL. You can follow any responses to this entry through the RSS 2.0 feed. Both comments and pings are currently closed.